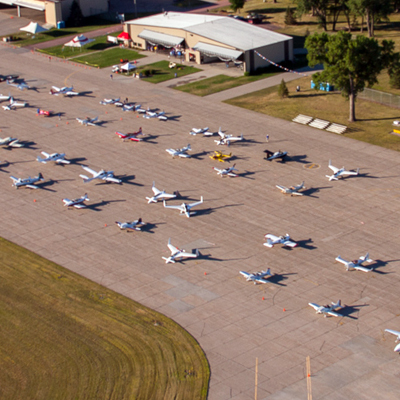 Airplanes of all types will line up at the starting line for the 22nd annual AirVenture Cup cross-country air race at 9am on July 21, 2019 at the Mt. Vernon Outland Airport – KMVN. Immediately after takeoff, they will turn eastward along the race course with intermediate checkpoints along the way to the finish line. After finishing the race we will land at Wausau Downtown Airport in Wisconsin. The race is open to a wide variety of pilots and aircraft, from sport pilots to astronauts, and J-3 Cubs to Turbine Legends. Over the years we have had people of varying aviation backgrounds and aircraft in all speed regimes race and win trophies. Aircraft are grouped into classes based on their experimental or production certification, engine size, induction type, and landing gear configuration to keep every aircraft competitive. More than just a cross country race, the AirVenture Cup is a weekend of fun-filled aviation activity. Starting on Friday, early arriving racers traditionally gather at a to be determined location for an informal meet and great. Attendees beware: the racing stories are like fishing stories, the speeds get faster as the night goes on! On Saturday the race will host an Airport Open House at the Mt. Vernon Outland Airport. People from the local community and surrounding areas will be invited to visit the race pit, inspect the race planes close-up and talk to competing pilots about the race, the airport, and general aviation. There is a block of rooms reserved at a group rate at the Drury Inn & Suites Mt. Vernon. Reference the AirVenture Cup Race when booking your room, or simply click the link below to be taken directly to the group rate. The Drury Inn is also a sponsor of the 2019 AirVenture Cup. Young Eagles rides will be available to local youth ages 8-17. This event, typically attended by over a thousand local spectators, is our chance to be ambassadors and advocates for general aviation, and to bring our little part of AirVenture to another city. Sunday is race day, launching the whole field of racers in an all out speed run to Wausau, WI. After finishing and having lunch, most racers will depart to Oshkosh, WI for the EAA AirVenture Oshkosh fly-in and convention. AirVenture Cup participants will enjoy parking in the race corral near Homebuilt Headquarters. On Monday night, results will be announced and trophies awarded at the awards ceremony. Racers, volunteers, friends, and family are all invited to celebrate another successful race and the start of a great week at EAA AirVenture Oshkosh!